Infor VISUAL Support Tips & News: Did you know that you can identify and eliminate invalid layers by running the Inventory Valuation report? Did you know that you can identify and eliminate invalid layers by running the Inventory Valuation report? Negative on hand quantities are one of the most frequent causes of month-end inventory valuation issues in an Actual Cost FIFO environment. It is advisable to identify and eliminate negative cost layers prior to running the Costing Utilities journal preparation steps. 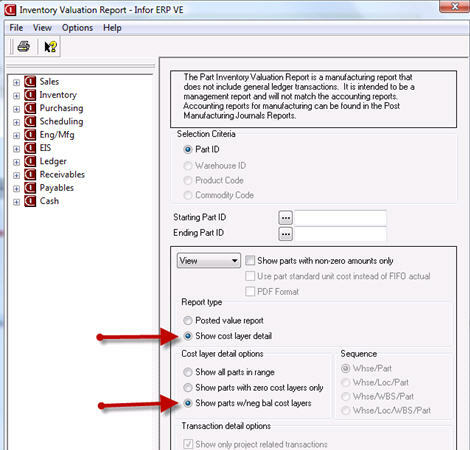 To identify the invalid layers, run the Inventory Valuation report found under the Inventory menu. This should be done immediately after running the Inventory transaction costing step of Costing Utilities. In the Report type section, select “Show cost layer detail”. In the Cost layer detail options section, select “Show parts w/neg bal cost layers”. This VISUAL Did You Know tip is brought to you by BizTech VISUAL Consultant, Jim Kistner.